I am posting this bus for sale for a friend of mine who works for WoodCrafters in Weslaco, Texas. The bus is a 1972 Eagle 05 with Model 10 front and rear caps. It has an 8V71 engine with a HT740 Automatic Transmission. It has new tires, new king pins, 4 cylinder diesel generator and a front lounge with leather sofa and seats. The bus was used to promote the woodcrafters products around the country. The bus has had the silver siding replaced quite a few years ago and looks to be in excellent condition. If anyone is interested in this bus, I will be happy to inspect it for you. 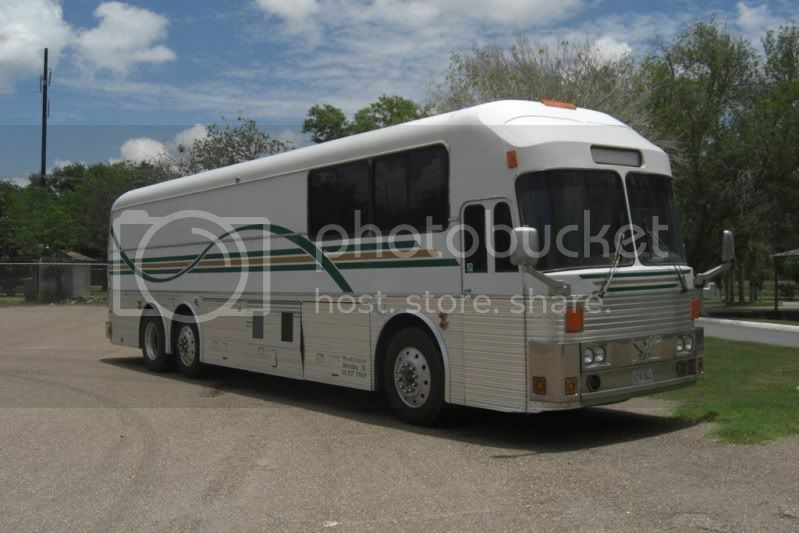 Any interested in purchasing the bus should contact Simon Peralez at 956-650-0286 and you can discuss prices with him. It would not post using the ebay box for some reason, so here is the link copied and pasted. Paul, you don't use the whole link for the eBay code. Just put the auction number in.